The Butterfield Overland Mail Company was established by John Butterfield of Utica, New York, in 1857. He contracted with the United States Postmaster General to transport the mail from the Mississippi River to San Francisco, California, including a major route from Memphis, Tennessee, to Fort Smith, Arkansas, and a route form St. Louis through Missouri and northwest Arkansas, including stops in Fayetteville and Elkhorn Tavern, and ending in Fort Smith, Arkansas. The Butterfield Overland Mail Centennial Commission was formed in Arkansas in the 1950s as a part of the national celebration with W.J. Lemke of Fayetteville, Arkansas, as its Arkansas chairman. Others on the commission included Ted R. Worley of the Arkansas History Commission and J.H. Atkinson of Little Rock Junior College. National committee members included H. Bailey Carroll of Texas, Lewis C. Jones of New York, and William J. Peterson of Iowa. Along with local events commemorating the anniversary along the different routes, a centennial caravan was organized from Tipton, Missouri, to San Francisco, California. The records include correspondence, newsletters, programs, maps, sketches, published materials, and research notes, as well as papers involving the organization of the Arkansas commission, as well as the organization on the national level. The Arkansas History Commission has canceled its regular quarterly meeting scheduled for Thurs., Sept. 7, 2017, at 10 a.m., and has rescheduled the meeting for Thurs., Sept. 21, 2017, at 10 a.m. They will meet in the Arkansas State Archives conference room, located on the second floor of the Multi-agency Complex at One Capitol Mall, Little Rock, Arkansas. This meeting is open to the public. The Arkansas History Commission is an advisory body to the Arkansas State Archives. The Arkansas State Archives is an agency of the Department of Arkansas Heritage and is responsible for collecting and maintaining the largest collection of historical materials on Arkansas in the world. The State Archives has two branch locations; the Northeast Arkansas Regional Archives is located in Powhatan and the Southwest Arkansas Regional Archives is located in Washington. Other agencies of the Department of Arkansas Heritage include the Arkansas Historic Preservation Program, the Arkansas Arts Council, the Delta Cultural Center in Helena, the Old State House Museum, the Arkansas Natural Heritage Commission, the Mosaic Templars Cultural Center, and the Historic Arkansas Museum. For questions and comments, please contact the Arkansas State Archives at 501-682-6900. The Arkansas State Archives and the St. Francis County Historical Society are hosting an archives and special collections workshop from 9 a.m. until noon on Sat., Sept. 23, at the Woodruff Electric Co-op- Corporation building in Forrest City, Department of Arkansas Heritage Director Stacy Hurst announced today. The event is free but registration is required. Registration is limited and deadline for registration is Sept. 18. Check-in for the event begins at 8:15 on Sept. 23. The Arkansas State Archives is an agency of the Department of Arkansas Heritage and is responsible for collecting and maintaining the largest collection of historical materials on Arkansas in the world. The State Archives has two branch locations: the Northeast Arkansas Regional Archives is located in Powhatan and the Southwest Arkansas Regional Archives is located in Washington. Other agencies of the Department of Arkansas Heritage include the Arkansas Arts Council, the Arkansas Historic Preservation Program, the Delta Cultural Center in Helena, the Old State House Museum, the Arkansas Natural Heritage Commission, the Mosaic Templars Cultural Center, and the Historic Arkansas Museum. The St. Francis County Historical Society is a charitable organization that exists to preserve and promote the history of St. Francis County. Its mission is to discover and collect any material which may help to establish or illustrate the history of the area. For more information about the workshop, email events.archives@arkansas.gov or call 501-682-6900. To register, please visit https://caring-for-collections.eventbrite.com. John S. Polk Accretion, 1 cu ft. Bold Pilgrim Cemetery Preservation Association Project, 10 cu. ft.
Lucille Rogers Hefley Family papers, 1 cu. ft.
State Board of Barbers Examiners records, 6 cu. ft.
Camden African American Historical Markers Project final grant report, 0.1 cu. ft.
PAAC (Preservation of African American Cemeteries) Junior Preservation Society final grant report, 0.2 cu. ft.
Washington County Historical Society final grant report, 0.25 cu. ft.
Mike Rankin genealogy papers accretion, 2 cu. ft. Aesthetic Club records, 2015-2016, 0.10 cu. ft.
Arkansas Pollution Control and Ecology Commission, 54 cu. ft.
Secretary of State records, 2001-2008, 62 cu. ft.
Arkansas State Parks records: Mt. Nebo State Park, 0.25 cu. ft.
Epilogue to Horace Adams' manuscript "The Seekers"
J. E. Little Farm records, 0.5 cu. Ft.
New Hope Missionary Baptist Church record book [Amity, AR] and loose correspondence, 0.25 cu. ft.
Jane Ragan Crecink scrapbook, 1 cu. ft.
Arkansas State Medical Board Records, 14 cu. ft.
Spencer family papers, 0.6 cu. ft.
Mize-Justus family papers, 1.15 cu. ft.
Billie Jewel Colbert was born December 20, 1924, to Hubert and Beulah M. Colbert. He attended school at Powhatan prior to entering the Army in July 1943. In June of 1944, he died in battle in France. He was posthumously awarded both the Purple Heart and Silver Star. His parents, and later his brother Jack, kept a scrapbook with the photographs, correspondence, commendations, and newspaper clippings collected through Billie's service, subsequent death, and ongoing communication from military and governmental agencies and offices. Billie's brother, Jack M. Colbert, served during World War II in the Marine Corps, and his brother, Clifford R. Colbert, was a Navy veteran. His other siblings included sisters Gladys and Thelma. This collection includes correspondence, citations, newspaper clippings, photographs, and school records. There are letters from Billie Jewel Colbert to his family, from his days in basic training until just prior to his death; correspondence from other soldiers in his unit following his death; letters from government and military officials; correspondence about death benefits, citations, transportation of his remains, and other official matters; insurance documents. The documentation of his awards are included, however both the Purple Heart and Silver Star medals are held by Arkansas State Parks. The materials in this collection document Private Colbert's experience through training, his service in England and in France, and the official processes that follow the death of a soldier in combat. Notice No. 2: Claim for Amounts Due Deceased Personnel of the Armed Forces of the U.S.
1945 June 21: Times Dispatch, Walnut Ridge, "Buddy Tells How Pvt. Colbert Met Death"
"Powhatan Soldier Killed In France; Awarded Medal, Is Also Commended"
"Last Rites for Billy J. Cobert"
"Silver Star To Heroic Soldier"
Parcel wrapper from package sent by Hubert Colbert to Billie Jewel Colbert, returned to sender, marked "Deceased"
One of the questions we’re often asked at the State Archives is if we’re familiar with genealogical DNA testing and if any of the staff has had genealogical DNA testing done. Until recently, none of us had. But last month, I, the Arkansas Archivist and another co-worker, tackled genealogical DNA testing. As a quick disclaimer, we’re not allowed to advertise for certain companies, so for the sake of this blog post, I also asked some friends who had tried other companies’ DNA test kits to offer up their own experiences and thoughts. As it turns out, their experiences were very similar to mine. It seems that aside from pricing and a few variations in options, how the DNA is collected, how it is processed and tested, and how the results are delivered are pretty much the same. So, to start, I ordered my DNA test kit online. It took less than a week to arrive. It came in a fairly small box with written instructions, a collection container, and a mailing box (with prepaid postage) to send the sample back in. The written instructions suggested I download the company’s DNA app on my phone or tablet before starting the process, so I did. The app allowed me to easily register my kit (in fact, the app I used let me literally scan the bar code of the kit with my phone’s camera, which automatically registered my kit for me). Registering your kit is an important step – it’s how they will track your sample. I was instructed not to eat or drink anything for 30 minutes before giving my sample. The app had a timer with an alarm I could activate so I didn’t have to watch the clock. It notified me once my 30 minutes had passed. I used the app to walk through all of the steps of putting together the sample (and had the written instructions as well, just in case). The app’s instructions first told me how to unscrew the sample container, which is a plastic tube. There was a line on the tube that I was instructed to fill up to and not go past. It actually doesn’t require a lot of saliva – the line on the tube is fairly low on it. However, it’s surprisingly hard to produce the required amount of saliva on command. After a few minutes, though, I’d deposited the appropriate amount into the tube. The next step is also very important. Each tube comes with a cap that contains a blue solution. You will have to screw that cap onto the tube strongly enough to release the blue solution into the tube. Once it’s released, you will need to shake the tube for at least 5 seconds to make sure it well-mixed. The app also provides a timer for this. Once that’s done, the sample is ready to be mailed. I placed mine into the provided mailing box, sealed it up and dropped it in a mailbox near where I live. The instructions had told me that it would take 6 – 8 weeks to get my results back. In the meantime, it invited me to answer a series of questions about myself (traits, characteristics, likes and dislikes and personality questions) to compare to go along with my DNA results. That part is optional, but I went ahead and answered them. The questions asked about things like eye and hair color, food preferences, food allergies, personal interests and hobbies - nothing too personal or overly invasive, but clearly geared toward finding out if genetics play a role in any of the above. Ultimately, I didn’t have any huge surprises. Like most people who have researched their genealogy, I’d already done enough research to have an idea of what to expect. The only thing I was a little surprised about was the Iberian Peninsula connection. The results also gave me the option of connecting with distant cousins (second and third) through a subscription to the company’s service, which I haven’t done. 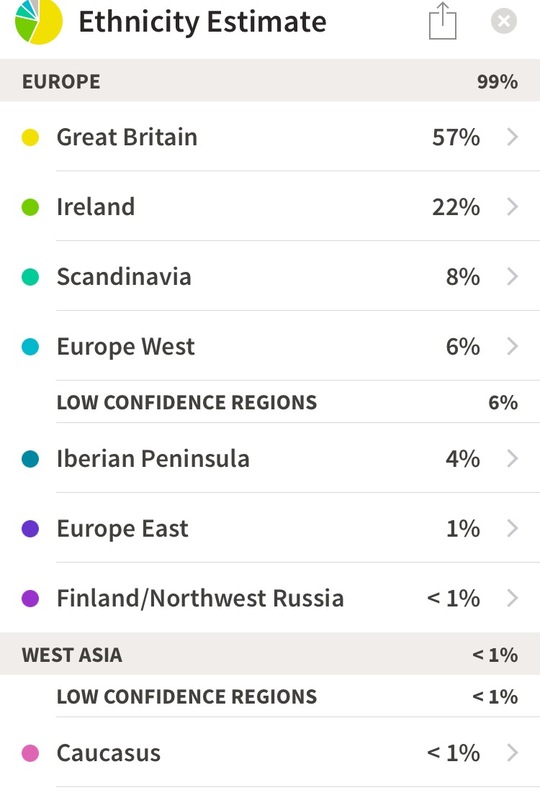 One of the things I learned through this process is that my immediate family’s DNA will differ from mine in both percentages and even possibly, ethnicities. With siblings, it’s possible to end up with differing percentages of ethnicity. For example, I have 22% Irish DNA – my sister’s DNA could contain more or less than 22%...or even none at all. 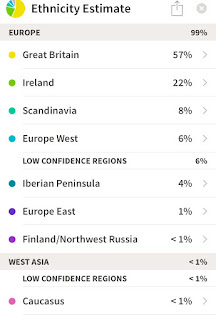 My sister’s DNA could also come back with no connection at all to the Iberian Peninsula and an altogether different ethnicity could pop up instead. DNA is passed down in pretty interesting ways. I’ve asked my family if they would be interested in testing, too….we’ll see what they decide. So, would I recommend genealogical DNA testing? It depends. I think if you’re genuinely curious about your origins and if you’re open to the possibilities, then sure, go for it! As I said above, my results overall weren’t that surprising, but I knew going in that if I found out anything truly shocking, it wouldn’t change how I viewed myself or my family. I knew I would be able to roll with whatever presented itself. However, if you have a set idea in your head of who you are and you won’t be happy if that gets challenged, I would probably recommend against doing it. I know some people who found out some truly unexpected, life-changing things that would leave anyone shaken. And that’s always a risk when trying DNA testing. Ozro A. Hadley was born on June 26, 1826, at Cherry Creek in Chautauqua County, New York, the son of Alvah Hadley and Eunice Bates Hadley. He served as governor of Arkansas from 1871 to 1873 after Powell Clayton became a United States Senator. Hadley owned a plantation on Grand Prairie in Lonoke county, and served as the registrar of the United States Land Office at Little Rock from 1875 until 1877. President Rutherford B. Hayes appointed him postmaster of Little Rock on June 6, 1877, and he served until 1882, when he moved to New Mexico Territory. He died July 18, 1915. This collection contains correspondence, post office forms, legal papers, receipts, and other materials.